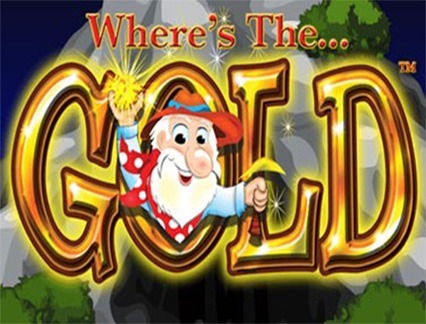 Where's the Gold from Aristocrat - Play Free Slots Online. Game Information: Dig for gold along with software developers Aristocrat and explore the mines like a true gold digger. Released in 2003, the fun themed game has been designed with 5 reels and 25 paylines and a RTP percentage of 95%. Although considered a medium variance pokie game, players have said the entertainment of playing as well as regular payouts make it one of the best inventions by Aristocrat. A fantastic bonus game has been developed for golden theme enthusiasts and to top it off there is a massive jackpot win of 10 000 coins is offered to players luck enough to hit the highest winning combination. Thanks to a simple yet pleasantly appealing design, players should encounter no problems whatsoever when enjoying a game of Where’s the Gold. The general look and design can be recognized as with all 5 reel and 25 payline pokie machines, making learning how to play as easy as any other pokie machine game. Players are guided throughout the game and just so long as luck is on their side, there really are no wrong moves to play. The flexible betting amounts allow players who are new to the game to make smaller wagers, saving them money and in turn, making them feel more confident to place higher bets when they become better familiar with the pokie game. The Scatter Symbol: When the Dynamite symbol appears 3 to 5 times simultaneously, the bonus round is then activated. The Bonus Round: When the player unlocks the bonus round, a set of characters are presented and the player is required to choose one of the following characters; Nugget Net, Mary Money, Peter Panner, Professor Gold and Happy Lucky. Once the selected character has been chosen all the characters on the screen begin digging for the players gold. These are bonus coins and will determine how many free spins will be unlocked in the free spins round. The Free Spins Round: During the free spins round players can unlock up to 10 free spins and during this round all regular symbols are replaced with Golden Wilds, helping players unlock more winning combinations and substantially increase the player’s bankroll. The Gamble Game: Included in the base of the game, players are treated to a gamble feature which can be opened after a winning combination has been obtained. The gamble game will either double, triple or quadruple winnings depending on if the player as guessed the correct colour of the hidden card. Upon guessing correctly, the player will then progress onto the next round or have the option to cash out. Should the player choose incorrectly, they stand to lose all winnings earned from the previous play. The Wild Symbol: The wild is the gold symbol and substitutes all symbols apart from the scatter and features in the free spins bonus round. Unconventionally designed, Where’s the Gold sports no background music. Although there are sounds incorporated to provide the ultimate pokie theme upon winning combos, there are no other annoying sound elements making it the perfect game for those who appreciate calming sound effects. 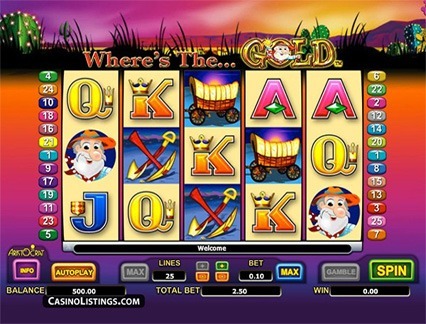 The graphics make the game come to life with bold colours and entertaining symbols while players can enjoy the comical symbols of the gold diggers. All symbols are unique to the game, making gameplay an enthusiastic one for all new comers. The jackpot is one of the most prominent features of the game, awarding winners a maximum payout of 10 000 coins. Depending on the amount bet, the substantial reward of 10 000 coins can prove to be an impressive win. Without unlocking the jackpot prize, regular winnings also prove to be impressive for those looking to dig up golden coins. As this particular pokie game offers no progressive jackpot, players can bank on winning smaller amounts on a frequent basis due to the medium to high volatility percentage payout. The bonus round, free spins and gamble game are the special features of the game and players who enjoy interactive gaming will appreciate these features as they add an element of excitement and generous payouts to those lucky enough to unlock these features. The gamble game is easily activated after each winning combination and depending on the luck of the pick; players stand to double their winnings in one lucky guess. 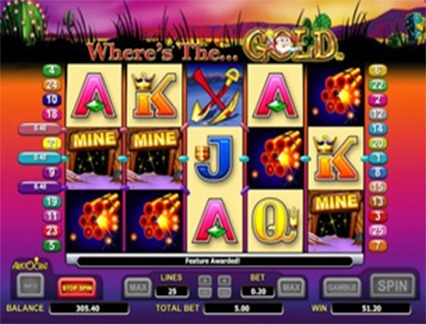 A uniquely designed pokie machine is what players can expect to encounter when they choose to play the ever-popular pokie machine game; Where’s the Gold.